I just returned from vacay, spending my last day in Dublin after leaving Switzerland. We went to the National Museum of Ireland, where we saw tons of beautifully executed golden objects that have been found in bogs over the years. These ancient objects are dated to the first 1000 years BCE, giving an image of a culture with resplendent metalworking and particularly fine gold work. The sophistication of these early Celtic / Viking cultures (pre-Roman and certainly pre-Christian) surprised me. How many cultures have you not thought about in the last, say, 24 hours? How about the rich cultural history of Java, Indonesia? This beautiful, sculptural temple complex is located in south-central Java. It was built during the rule of the Medang (or Mataram) Kingdom, which flourished, along with many other dominating kingdoms in Indonesia, between the 700s and the 900s CE. The Medan Kingdom was the ruling entity when the Great Stupa at Borobudur was built. It is generally believed that the earliest inhabitants of the Indonesian archipelago were of Indian or Burmese origin. Later migrants known as Malays came from Southern China and Indochina at around 3000 BCE. Hinduism was introduced from India through trade during the first 100 years CE. 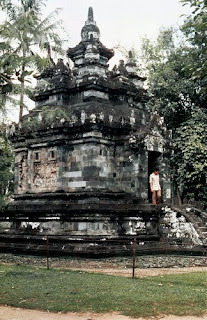 Hindu kingdoms were established in Kalimantan, Sumatra, and Java between the 400s and the 1200s, some of which had also absorbed Buddhist influences. The Medang, a Hindu-Buddhist kingdom, evolved at the same time as the massive Srivijaya Empire in Sumatra and western Java. Interestingly, although few inscriptions from either culture survive, they appear to have been similar in the fluid manner in which they ruled, with kings overseeing regional overlords who were more or less autonomous. Similarly, both the Medang and Srivijaya seem to have established what could be considered urban centers. Javanese architecture began under Hindu influence. 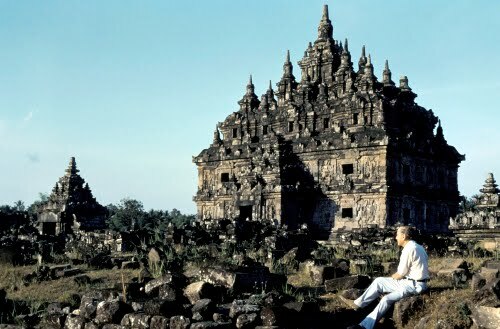 There was a surge of Buddhism from about 750 to 850 (as evidenced by the monumental Stupa in Borobudur), followed by a second flourishing of Hindu architecture that lasted from the late 800s until the 1300s, with the coming of Islam. The Plaosan temple complex is a large group of Buddhist temples. Plaosan Lor (North Plaosan Temple) was dedicated to the Dhyani Buddha, the five celestial Buddhas believed to have existed since the beginning of time. This is one of two temples in the center of the complex. It was built on a 2 foot (60 cm) high base, and, like the Great Stupa at Borodubur, contains a grouping of multiple towers at the top, a symbol of the world mountain, Mount Meru. 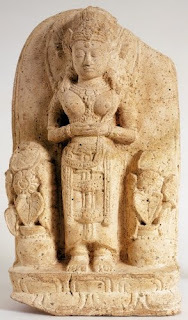 This female figure may have been a celestial woman or deity from the decoration of a temple. In style, it is very similar to the female figures depicted on the exterior of the Great Stupa of Borobudur, in the Medang Kingdom. This indicates the vast influence the Indian sculptural style had as Hinduism and Buddhist spread throughout Southeast Asia. The Sryivijaya Kingdom was Hindu-Buddhist, and was ruled by Tamils centered in Palembang, Sumatra. After the Funan culture (centered on mainland in Cambodia) had been defeated in the region, the Srivijaya dynasty established itself around the late 500s CE, and thrived between the 700s and 1200s CE. The kingdom enriched itself by controlling the sea trade in the region, particularly that to India and China. The kingdom established control over Sumatra, western Java, and much of the Malay peninsula. Like the Medang kingdom, the Srivijaya rulers established vast Buddhist temple complexes that were famous for their exterior sculptural decoration. Pawon Temple is one of three Mahayana Buddhist temples built during the Sailendra Dynasty of the Medang Kingdom. The name Pawon derives from the word for “kitchen” in the Javanese language, which in turn comes from the root word for ashes or dust. It is theorized that the term pertained to the fact that the temple may have contained the cremated ashes of a king. It is on a northeast-southwest axis between the temples of Mendut and Borobudur. The multiple towers and high platform are similar in style to the other two temples. Various scholars have proposed the origins of the Sailendra to eastern India, Cambodia, and Sumatra. Early inscriptions mentioning the dynasty name date to 778 CE in the Kedu Plain in central Java. The Sailendra rulers had good relations with the Srivijaya Empire in Sumatra. It existed next to the Sanjaya dynasty in Java, and around ca. 850 CE it seems to have been subsumed by the Sanjaya. The next mention of the Sailendra was as rulers in Sumatra associated with the Srivijaya. An Indian invasion by Chola rulers in 1025 conquered Sailendra territories in Sumatra and seems to have ended their rule there.